I've previously defined boychik as a young man with more chutzpah than brains. 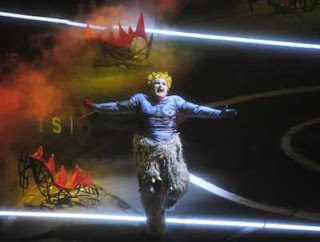 Georja and I recently reviewed Wagner's opera Siegfried, the third episode in his marathon cycle The Ring. It's playing now at LA Opera. In the myth, Siegfried represents the human race, which in the dawn of history is just coming into its own. In this installment of the story, Siegfried will slay the fearsome dragon who guards the ring--the symbol of ultimate power. Thus will begin the ascendancy of humans and the decline and eventual disappearance of the gods who once dominated the earth. The Lord of the Rings borrows the same symbol. I spend a significant portion of the review musing about Wagner's infamous racism and the moral imperative that the Third Reich subsequently drew from The Ring.